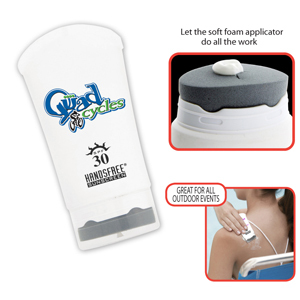 A high quality SPF 30 sunscreen made in Australia with the patented Hands Free applicator for applying the cream only where you want it. Great for all sports and outdoor activities like golf, biking, fishing and any sport where sunscreen on the palms affects performance. It is hypo-allergenic, oil free, Paba free, sweat proof and UVA/UVB. Nanoparticle free. Available in a range of color(s) including All-Pearl only.